The SKB GB66 Electric Guitar Gig Bag is a durable, transport bag designed to accommodate most standard style, solid body electric guitars. The gig bag is constructed from durable ballistic nylon with dual heavy-duty dual zippers and an adjustable padded shoulder strap . The soft padded nylon interior features reinforced patches for maximum protection, while the exterior features an accessory pouch for carrying things such as string, tuners and more. This durable gig bag is the ideal choice for any musician needing to keep their guitar safe while transporting their instrument. The bag itself is constructed from durable ballistic-grade nylon with dual heavy-duty dual zippers resulting in a highly-durable gig bag that will protect your instrument from any superficial damage. The interior features a padded soft nylon construction with re-inforced ballistic nylon patches located in the headstock and bridge area to keep your instrument secure as well as protect from sharp string ends. The bag also features an adjustable, padded shoulder strap allowing you to carry your instrument on your back, for hands-free transportation. The exterior features a large accessory pouch that includes three tiers, allowing you to store your peripherals such as strings, tuners and more. 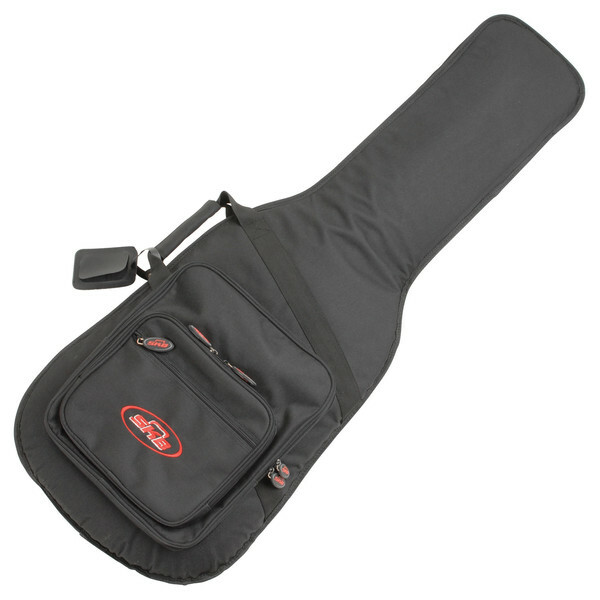 With its highly-durable materials and convenient design aspects, this gig bag is ideal for any travelling musician.